How much does a premised based VoIP phone system cost a small business? We explain how much an on premised-based VoIP phone costs a business. When it comes acquiring technology for your business, I always hear customers want something reliable, easy to use, future proofed, and cost effective. My first answer is that a phone system is an investment for your business, but we will get more into that later in the blog. Remember, a phone system should make or save you money through communication tools. If used properly, a phone system is a great tool to help keep the customers you have and get more new customers too. So how much does a premise-based VoIP phone system cost a small business? To give you the most practical answer, I’m going to break out the top 6 variables that impact the cost of a premised-based VoIP phone system for a business. How much will a premise based VoIP phone system cost? Here’s the quick answer: it depends! A premise based VoIP phone system will cost between $400 and $1,000 per phone station, inclusive of software enhancements and professional installation and end user training services. So, that means if your business has 50 phones, your budget will be between $20,000 and $50,000. Due to phone server technology, renting the phone hardware and software on a monthly agreement as an operating rental is very popular and will usually cost between $20 to $40 per phone per month. So, that means if your business has 50 phones, your budget will be between $1,000/month to $2,000/month to rent the phone hardware and software. The reason renting the phone server with hardware and software is popular is because of the nature of server based technology. Every 3-5 years’ major updates are needed to keep the server current with IT requirements like Microsoft and the manufacturer of the phone hardware and software. By enrolling in a phone rental agreement, it is easier on operating cash flow to simply extend out the agreement and acquiring all the software and server updates necessary to stay supported. Sometimes total cost of ownership for premised-based IP Phone technology is less than VoIP/Cloud system over a long period (usually between 5 and 10 years). The desktop software for end users and managers are more mature on premised based technology. I’ll go over this more in-depth in a moment. The customer is stuck in a T1 local and long distance contract for # of years and it is an easier transition to connect a premised based server to existing phone line connections than pay early termination fees and migrate to VoIP. The business has in-house IT department that can maintain the premised based technology with ease. Simply put, most smaller business with limited tech resources usually have better luck with a cloud based VoIP system. So if that sounds like you, then a premised based VoIP phone system might be right for you. But what about the cost? Why such a range? And what impacts it? I believe there are 7 key variables which will impact the total investment or cost for your premised based VoIP phone system. 1. How many physical phone handsets do you have at your office? The easiest way to do this is go get a hard count of how many existing phones you already have. If you are a very small business (i.e. under 15 employees) I don’t recommend buying or renting a premised based phone system. Your business size fits cloud based VoIP technology instead. 2. What IP phone manufacturer is being recommended to you? This a very important decision and this is one area customers get very confused and even sometimes frustrated. I stress that it’s a big decision because you’ll be stuck for a long time with this product (usually 3-5 years at the minimum) and it is not easy to undo a wrong decision here. It is understandable to assume that most phone manufacturers are very similar in functionality, software capabilities and price, but this is NOT the case. Just like in your business, when you get under the hood of the car, there is a lot more to it. My company represents Vertical Communications because the end user software is very attractive and easy to use. Additionally, the price point is very affordable to customers with organization that have between 30 and 350 employees. Vertical includes desktop software and mobile software for every user which is a big advantage when compared to other products. There are other reputable products in the New Jersey market like Mitel, Avaya, Shoretel and Cisco. However, they are products that scale upstream (up to 10,000 endpoints) and this reflected in the pricing and software licensing model. Other products that are quality but very basic that cater to small businesses are Panasonic, ESI, Toshiba and NEC. It is too detailed in this blog to break down every product out there but these are reliable phone systems, but lack software capabilities and the architecture is limited. These products don’t do well for more sophisticated needs for multi-site businesses, call recording, CRM integration or mobility applications. 3. What phone software applications do you need or want for your business? In telecom, the big 5 applications to consider are Desktop User Software, Mobility Apps, Contact Center, Automatic call recording and CRM Integration. As a customer base grows, so do the businesses servicing them, in number of employees, managers, and departments. You’ll need to invest in more sophisticated technology to manage all the moving parts. If you have 100 employees and 30 of them are in the service department, it becomes paramount to invest in the right phone system applications to run the departments effectively. Your personal computer and phone function as combined piece of technology. This is very important for anyone taking phone calls, voicemails and communicating often with other staff members. Leverage your existing smart phones with your VOIP Phones. This is a huge application for anyone in and out of the office and not glued to a desk. Provide important phone metrics to run and management tools to run your business. Contact Center also is used to provide real time phone metrics to have visibility into the departments (call activity, missed calls, customer time spend on hold, etc). Go back and listen to a conversation and avoid he said/she said. This application is huge and a must have for anyone in the service business. Do you have Salesforce? Microsoft outlook? Want to Click and dial when calling customers? Incoming screen pops when a customer calls in? CRM Integration ties in your phone system with whatever software program you are using. A critical aspect for a premised based VoIP phone system to perform properly is to provide a dedicated cat5 or cat6 cable for the IP phones. It is possible to “share” the computer cable with the IP Phones; this means the cable plugs into your IP phone than from the back of the IP phone into your computer. However, this is a big NO-NO. 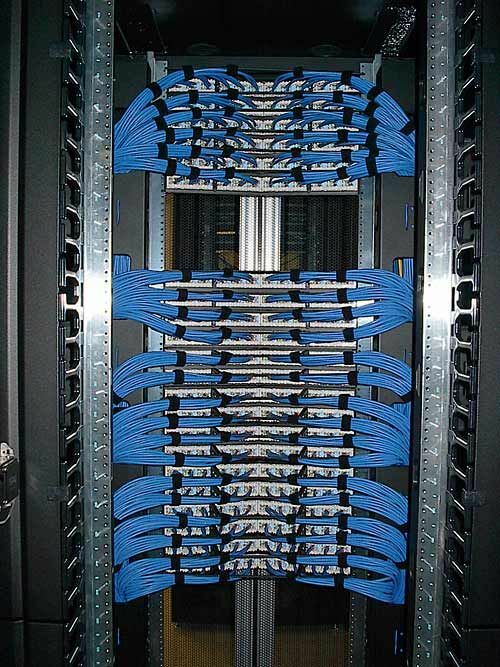 Sharing the computer cabling with your IP Phones can cause IT related headaches and cause a lot of finger pointing between the telecom and IT vendor when technical issues inevitably occur. So, if you do not have a cabling environment ready for IP Phones that leaves you with 1 or 2 options. The first option is to run new cabling for the IP Phones. This is a pricey and labor intensive project and can cost many thousands of dollars depending on the size of the project. The more practical option is to have your telecom vendor install a phybridge appliance. The sole purpose of a phybridge appliance is to convert your existing phone cabling to an IP signal so that updated IP Phones can work on an older cabling environment. This picture is an example of what a closet should look like. It’s clean, organized and VoIP Ready. 5. Who is the local dealer installing the premised based phone VoIP system? The local VoIP phone dealer is the company that you call for service and support and that manages your premised based VoIP phone system. Again, not all companies are created equal and this will be reflected in the overall price of your VoIP phone system. How trained is the staff and support team to be there for your business? Do they offer on-going training and education? Technology is changing rapidly and the good companies are ahead of the curve! When a customer calls or emails into support how quickly and easily will your issue get resolved? How close or far are they located from you? This will impact their desire to dispatch and come on-site. If you are a business in central Jersey do you think a phone dealer in NYC or out of state wants to send a VoIP Phone technical to your office and lose all that time? Does the local dealer also use the phone system they sold you at their office? This is big because imagine calling into a service representative and they don’t touch or use the product that they sold you. Obviously, check local references and choose a company that you can trust! Your best bet is to get some local references and choose a company that you, and other business in your area can trust. 6. What are the on-going maintenance and software licensing fees after the VoIP phone system is installed? Make sure when you are evaluating the proposal and recommendation that on-going maintenance and software licensing is included and not billed separately. This is a clever way for VoIP phone dealers to misrepresent the true cost to invest in the phone system technology. Also, this will put a bitter taste in your mouth if you have to pay for every phone call or email for support requests. Please include 5 years of software subscription from the manufacturer. Please include your maintenance fees for hardware failure and remote support services. Please include on-going training support for current & new employees. Include all necessary software licenses subscription in your proposal. Desktop, mobile, recording, contact center and CRM integration, etc. 7. What T1 or phone carrier is connecting to your premised based phone system? In addition to the price for the premised based phone system, don’t ignore the total cost for the carrier dial tone. In simple terms, who provides your company with local and long distance phone lines? Premised systems are designed to connect to analog lines, T1 lines or VoIP SIP Lines, this means you the customer can have very cost effective phone lines coming in and out, while also having back up phone lines in place. The most common time a business upgrades their premised based system is also when their T1 phone agreement comes due. Check out our article on the best time to upgrade to a VoIP phone system at my business. However, if you are under contract with your T1 provider and your old phone system is failing or unsupported, then there is little choice but to upgrade your premised based system before you can change out the carrier dial tone. This does happen from time to time. Closing thoughts on the cost of a premise based VoIP phone system at a small business. Simply put, a premise based phone system isn’t right for everyone. You’ll need a strong IT component to your company, and the financial backbone to either purchase a system upfront, or pay for it on a monthly basis. For those that are ready to learn more about a premise based VoIP phone system, you can click here to contact us online, give me a shout directly at vin@tele-datasolutions.com, or touch base with me at 908-378-1218.